Monday was definitely a Monday!!! I think that we have finally determined that our curly haired twin, when given Benadryl, becomes very psychotic excitable! In allergy season, when this is the only medication you have available, this is a bad thing! His straight haired twin brother, on the other hand, gets tired and whiney. That isn’t cute either! Today STUNK……. with a capital P that stands for PU! I did take some time to work on Fused Plastic Goodness. It was the highlight of my day! So!!! On with the show! First I made a reusable trash bag for my vehicle. I took 2 cereal box liners and opened them so that they lay flat. I scattered some red crayon shavings between the layers to give it some color. After fusing them together, I sewed a seam down the back, and across the bottom. I sewed across the bottom corners to make a flat bottom, but that is optional. I rolled a hem at the top to make it look finished. Second, I made a new makeup bag for my thirteen year old daughter. For this I fused two bags like above. 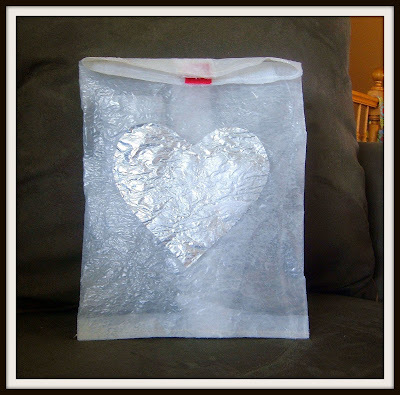 I cut a heart out of a silver liner that I had and sandwiched it between the layers. This time I fused the back seam, and the bottom seam, then hot glued some velcro as a closure. My third project was for teen girl too. 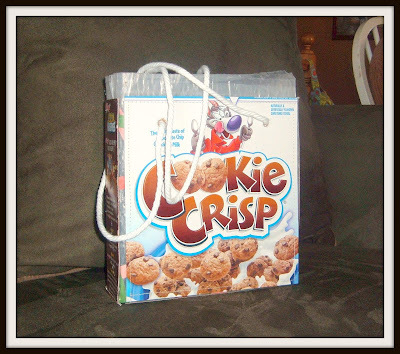 She has been begging me for a Capri-sun bag, but I thought a Cereal purse would be just as much fun. I used three liners this time. I cut pieces off of 2 cereal boxes for the front, bottom, and sides. First I glued the cardboard to the fused plastic, then sewed around the pieces. 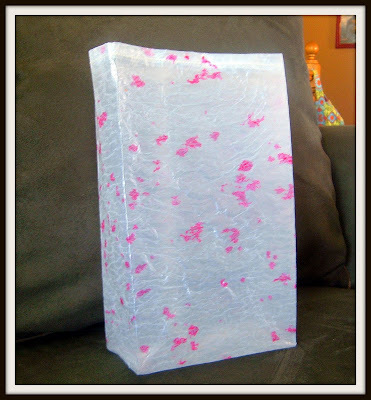 I used scissors to poke holes in the front and back, then used cording for the handles! We’re both happy with the results! I think I’ll make a Capri-sun wallet to go in it. holy crap-i had no idea that you could do all those craetive things with cereal boxes. You are amazing! you should be featured on oprach for going green-a+ ingre recysling! I could so use one of those garbage bags. If u makes one too many-send on my way!! Seriously-genius and I get to call her friend! Lola, you are so stinking creative! Those bags are all so dang cute! Dang, those are just RADICAL! 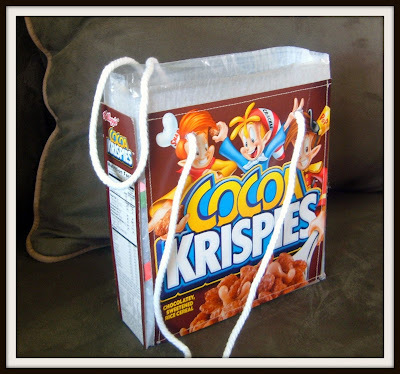 I’ll be over with my bran flakes box!My idea for reusing plastic would be to carry around the WalMart sack and call it a purse!